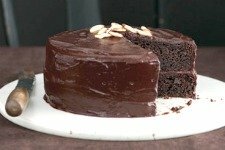 Anyone can make a cake with easy cake recipes. These easy and simple recipes do not require any special equipment or obscure ingredients. No baking experience is needed with our step-by-step instructions for these recipes. Whether you are looking for key lime cake recipies, red velvet cake recipes, an easy carrot cake recipe or an easy chocolate cake recipe, we have easy recipes for all your favorite cakes. Cakes have been a favorite dessert dating back to ancient times. The first cakes were very different from what we eat today. They were more like bread and sweetened with honey. Nuts and dried fruits were often added. According to food historians, the ancient Egyptians were the first to show evidence of advanced baking skills. The Oxford English Dictionary traces the English word cake back to the 13th century. It is a derivation of “kaka”, an Old Norse word. Medieval European bakers often made fruitcakes and gingerbread. These foods could last for many months. Any day can become a special day when cake is served. Most people don’t recall what they had for dinner, but everyone remembers a great dessert. Make a Bacardi rum cake, pineapple upside down cake or hummingbird cake and stand back and enjoy the compliments. Holiday memories often include a particular cake that is a family tradition. Whether these memories include your Grandmother’s special Christmas fruit cake or Mom’s butter pound cake, these holiday treats are sure to bring a smile. Fortunately for us, modern baking is “a piece of cake”. From homemade cake recipes to recipes using cake mix, you can make delicious desserts for your family and friends in very little time. So let them eat cake! Just click on one of the recipes listed below and start baking.